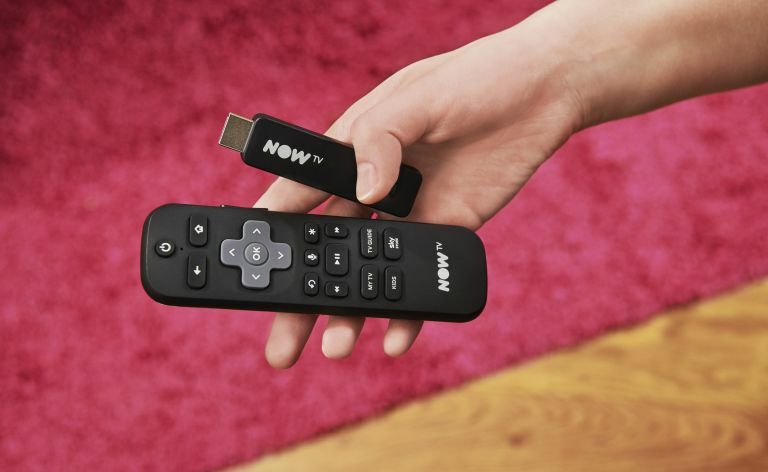 Now TV has unveiled its new Now TV Smart Stick, a USB streamer that once connected to any television allows its user to access a variety of pay-TV shows, movies and live sports, as well as live TV channels and online streaming services. The big takeaway? The Now TV Smart Stick only costs £14.99, officially making it the cheapest streaming stick in the UK by quite a way, beating off the rival £39.99 Amazon Fire TV Stick by a whole £25. For that remarkably low entry point you get a Full HD streamer powered by Roku tech (so the stick can deal with anything up to 1080p) with a redesigned Now TV remote with Voice Search, live TV pause functionality with up to 30 minutes of content held remotely in the cloud, access to all the UK's catch-up services like BBC iPlayer, in-built app access to popular online content sites like YouTube, and the ability to select from four core content passes to augment its base Freeview offerings. The passes, which can be bought without a contract on a month-by-month basis, consist of: Entertainment, Sky Cinema, Sky Sports, and Kids Pass. Each pass has a different monthly cost, with the Kids Pass ringing in at £2.99 a month, Sky Cinema at £9.99, Entertainment at £7.99, and Sky Sports at £33.99. Neatly, the Sky Sports Pass can also be bought on a daily basis for £6.99 and a weekly basis for £10.99. At launch a selection of Smart Stick and Pass bundles are to be available, including a £19.99 Stick and two-month Entertainment Pass combo, as well as a Stick and one-month Sky Cinema Pass for £19.99 and a Stick and one-month Sky Sports Pass for £29.99. For the release of the Smart Stick, Now TV has also redesigned its remote control, adding power and volume buttons (meaning users don't need to use multiple remotes), as well as a few shortcut buttons that allow users to jump straight to their favourite shows, the dedicated kids section, and the Sky Store. Now TV has also added a Voice Search button on the remote control, which once pushed allows users to audibly search for content. As well as searching directly by show name, users can also search through content via things like genre, or by a particular actor. Combinations of these things can also be searched for, such as asking for "comedies with Jim Carey". The Now TV Smart Stick goes on sale in February from a variety of UK retailers like Argos and PC World, as well as supermarkets such as Tesco and Asda. Lastly, in addition to unveiling its new Now TV Smart Stick, Now TV has also revealed that it is shortly to launch Now Broadband as a standalone contract-free service, purchasable without having to bundle in a Now TV Pass. Three speed packages are to be made available, 17 Mbs at £18 per month, 38 Mbs at £25, and 76 Mbs at £35. For more information about the Now TV Smart Stick, its various content passes, or Now Broadband, then head on over to Now TV's official website.